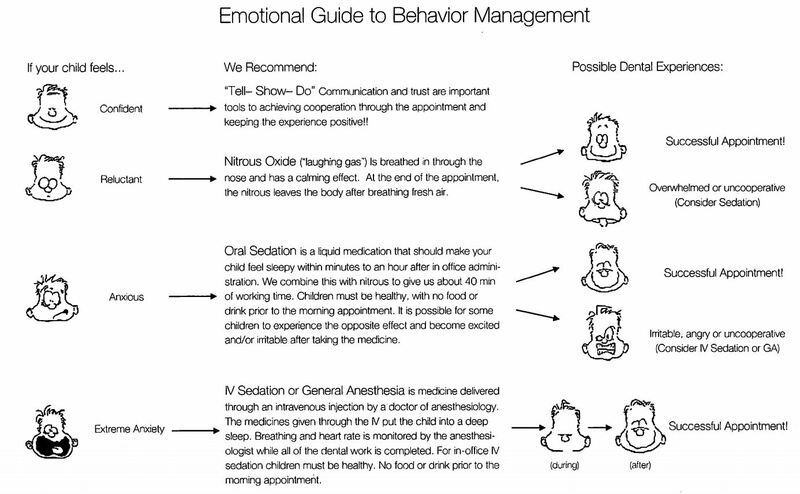 Oral Sedation is a liquid medication (Versed) that should make your child feel sleepy within minutes to an hour after in office administration. It is possible for some children to experience the opposite effect and become excited and/or irritable after taking the medicine. Your child will not be asleep during the procedure. The benefit for some children is that oral sedation can cause an amnesia like effect. Your child will also have a local anesthetic delivered to the area being treated so they will have to be watched closely for 4 to 5 hours following the procedure to be sure they do not chew their lip, tongue, or cheek. Most children cry throughout the treatment and this should be anticipated. Protective stabilization is used to keep your child safe during the procedure. Children must be healthy and have had no food or drink after midnight the night before the appointment. Please notify our office of any change in your child's health and/or medical condition. Should your child become ill just prior to a sedation appointment, contact our office to see if it is necessary to postpone the sedation. Tell us about any prescribed, over-the-counter, or herbal medications your child is taking. Check with us to see if routinemedications should be taken the day of the sedation. Also, report any allergies or reactions to medications that your childhas experienced. Food and liquids must be restricted after midnight the night before your child's appointment. Fasting decreases the risk of vomiting and aspirating stomach contents into the lungs, a potentially life-threatening problem. We will not proceed with the sedation if your child has eaten or had anything to drink. Dress your child in loose fitting, comfortable clothing. This will allow us to place monitors that evaluate your child's re-sponse to the medications and help ensure your child's safety. These monitors may measure effects on your child'sbreathing, heart rate, and blood pressure. If you child is not potty trained or occasionally wets the bed at night, consider having them wear a pull-up to the appoint-ment or bring a change of clothes...just in case. Try not to bring other children to this appointment so you can focus your attention on your child undergoing sedation. If you will be traveling home by car or if you must bring any other children with you to this appointment, it is preferable to have 2 adults accompany the patient home. On the way home, one individual should be able to observe the child's breathing without any distractions, especially if the patient falls asleep while in the car or safety seat. If any sedative medications are administered before your child is taken to the treatment room, we will ask you to watch your child closely as he/she may become sleepy, dizzy, unsteady, uncoordinated, or irritable. You will need to remain next to your child to prevent injuries that may occur from stumbling/falling. Keeping your child calm but distracted from the unfamiliar surroundings often is helpful. 15 minutes after giving your child the medication, the parent/guardian will be asked to wait in the waiting room in order for Dr. Cara and team to give your child their complete focus during the procedure. The parent/guardian must not leave the office for any reason. Dr. Cara and team will evaluate your child's health status before he/she will be discharged home. Children recover from effects of sedatives at different rates so be prepared to remain at our office until the doctor has determined your child is stable. At discharge, your child should be responsive but may be drowsy, crying, or fussy. Once home, your child will still be drowsy and must remain under adult supervision until fully recovered from the effectsof the sedation. If your child wants to sleep, position your child on his/her side with the head supported and the chin up.During this period, check your child's breathing and airway every 3-5 minutes. If your child is snoring, reposition the headuntil the snoring disappears and your child breathes normally. If breathing becomes abnormal or you are unable toarouse your child, call 911 immediately. Nausea and vomiting are occasional side effects of sedation. If vomiting occurs, immediately clear the material from yourchild's mouth. Once again, be sure that breathing is normal. If breathing becomes abnormal or you are unable to arouseyour child, call 911 to contact emergency services immediately. If vomiting persists for 20 to 40 minutes, contact our of-fice immediately. Your child may be drowsy for some time after the sedative appointment. Restrict activities for the remainder of the day.Prohibit potentially harmful activities such as bike riding, swimming, using playground equipment, or any activity wherebalance is important. In addition to the sedative medications, we often use local anesthetic to numb the mouth during dental treatment. Thenumbness usually lasts 2-4 hours. Watch to see that your child does not bite, scratch, or injure the cheek, lips, or tongueduring this time. Children may be irritable after treatment. If this occurs, stay with your child and provide a calm environment. If you be-lieve the irritability is caused by discomfort, you may give your child acetaminophen (Tylenol®) or ibuprofen (Motrin®,Advil®). Follow the instructions on the bottle for dosing based upon your child's age/weight. Once your child is alert, you may give him/her sips of clear liquids to prevent nausea and dehydration. Small drinks takenrepeatedly are preferable to large amounts. The first meal should be something light and easily digestible (soup, Jell-O®,apple sauce). Do not give fatty or spicy foods (French fries, tacos, salsa, milk, cheese or yogurt). A slight fever (temperature to 100.5°F) is not uncommon after sedation. You may give your child acetaminophen(Tylenol®) or ibuprofen (Motrin®, Advil®). Follow the instructions on the bottle for dosing based upon your child's age/weight. Because dehydration may cause a slight increase in temperature, clear fluids may help correct this condition. If ahigher fever develops or the fever persists, call our office.